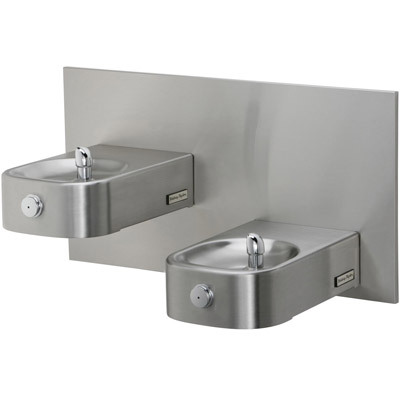 The Halsey Taylor HDFFBLEBP Drinking Fountain is a two face-mounted 14 gauge heavy duty, one-piece, non-corrosive stainless steel number 300 series unit with brushed satin finish and one piece vandal resistant drain. The Halsey Taylor HDFFBLEBP has large, seamless, drawn contour-formed basins with softly rounded corners and edges that reduce splatter, insures proper drainage and prevents standing waste water. The Halsey Taylor HDFFBLEBP is designed to be easily accessible to both physically challenged and able-bodied individuals, is ideally suited for installation in public areas. The Halsey Taylor HDFFBLEBP drinking fountains include push-button water activation on the front and contour-formed basins to eliminate splashing and standing water and each bubbler is a chrome-plated vandal-resistant type with integral hood guard and anti-squirt feature. The Halsey Taylor HDFFBLEBP complies with the requirements of A.D.A. (Americans with Disabilities Act) when properly installed. Also meets the guidelines for children's environments providing the floor to orifice height is 30" or less and proper clear floor space is provided for parallel approach. (Based on Architectural and Transportation Barriers Compliance Board final ruling.) Check Local and State Codes. The Halsey Taylor HDFFBLEBP is certified to be lead-free as defined by the Safe Drinking Water Act. Halsey Taylor Water Coolers are manufactured with a waterway system utilizing copper components and completely lead-free materials. The Halsey Taylor HDFFBLEBP waterways have no lead because all lead materials, such as leaded brass, have been removed. All joints are brazed using silver solder only. No lead solder is permitted. A strainer with an easily cleanable screen is provided to allow trapping and convenient removal of waterborne particulate of 140 microns and larger prior to their entry into the water cooler. Vandal-resistant bubbler is one-piece chrome plated, with integral hood guard design to prevent contamination from other users, airborn deposits and tampering. Backpanel constructed of stainless steel, number 300 series with satin finish. Solid 14 gauge heavy duty stainless steel underplate and vandal resistant pinned torx screws. 1/4" thick heavy duty stainless steel mounting backplate on fountain arm.